Cow Cow Boogie (1942) — In this 1942 Soundie, featuring the song “Cow Cow Boogie” (Benny Carter, Gene DePaul, Don Raye) Dorothy Dandridge, looking cute in a short skirt cowgirl outfit, punctuates her vocals with shimmies and hip shakes, backed by a group of hip-shaking chorines. Freddy Slack & his Orchestra, with vocal by Ella Mae Morse, had a 1942 hit with their recording of the song. The November 1943 recording by the Ink Spots and Ella Fitzgerald was a top ten hit in 1944, #1 on the R&B chart. Swing for My Supper (1941) – This was, according to the site Wild Realm Reviews, Dandridge’s first Soundie. I haven’t found songwriter credits yet and the opening credits are missing. Lazybones, the 1941 soundie,features Hoagy Carmichael, vocals/piano with (unseen) Bob Crosby and his Orchestra, and dance by Dorothy Dandridge and Peter Ray. The song Lazybones (Hoagy Carmichael, Johnny Mercer) was written and introduced in 1933. 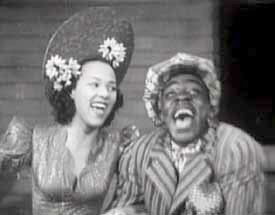 Ted Lewis and Mildred Bailey had early hit records. The Soundie A Zoot Suit with a Reet Pleat features the song A Zoot Suit (For My Sunday Gal) written by Ray Gilbert and Bob O’Brien. This 1942 soundie features vocal performances by Dorothy Dandridge and Paul White. They are supported by Ted Fio Rito & his Orchestra (unseen). The Soundie Paper Doll features the vocals of the Mills Brothers, with dancing by Dorothy Dandridge. Dandridge is the paper doll which transforms into a live, though still doll-sized, dancing woman after her figure is cut from a large photograph. * Objections to this short film because of it’s pseudo-primitive-tribal/jungle theme in music, dance, and dress seem rather puritanical to me. Was it a white man’s fantasy? Perhaps. 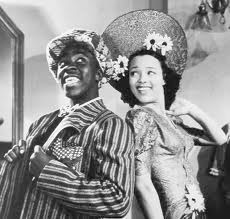 Have African American film makers made far more risque films, with equally sterotypical characters, dress, and themes? Definitely. Is it possible to make or perform in such a film and call it good, wholesome fun? Why not? I am not entirely insensitive to the many issues involved. Racial stereotypes may have been still accepted as factually based by a large majority of Americans at the time this was made. Law, custom (mores and tradition), prejudiced belief systems, ignorance, and pseudoscience variously provided support, and lent a veneer of legitimacy, to them. Jungle Jig confronts examples of racial stereotyping, including some of the worst fears of certain white men about so-called “primitive” races or cultures (uninhibited sexuality, immorality, cannibalism) with joyful mockery of the stereotypes. Grab a chick that’s slick and holler Bingo!